Lennard Zinn takes questions regarding how long aluminum frames and other bike parts should last before they fail. I have a high-quality aluminum bicycle frame that has been through 24,000 miles of commuting and touring. The frame has had proper maintenance, has never been crashed, and by all outward appearances is in very good condition. I’m planning a lengthy loaded tour on this frame. Since aluminum is subject to metal fatigue, is the number of miles on the frame a practical concern with respect to structural integrity? Yes, the number of miles is a concern, because aluminum has no “fatigue limit” (a.k.a. “endurance limit”). Let me explain. While not every engineer uses the same terminology, for the purposes of this article, a material’s fatigue limit or endurance limit is the highest stress that the material can withstand for an infinite number of cycles without breaking. When it comes to metals used in bicycle frames, only steel and titanium have a fatigue limit. This means that if the stresses applied are below a certain percentage of a steel or titanium tube’s ultimate strength (or “tensile strength” — the stress required to break it with a single application of that stress) — the percentage at the fatigue or endurance limit, then no number of stress cycles will result in failure. This fatigue or endurance limit can be seen on an “S-N curve” — a graph of magnitude of applied stress on the vertical axis vs. the number of stress cycles on the horizontal axis. The S-N curve for steel and titanium sweeps down from the upper left toward the right until it hits the fatigue or endurance limit (typically about half of its tensile strength), after which it forms a horizontal line continuing indefinitely to the right. Aluminum does not have a distinct fatigue or endurance limit, so its S-N graph curves down from the upper left to the right and continues to curve down lower and lower toward the lower right corner of the graph. This illustrates that it will eventually fail even from low stress applications, given enough of them. I of course have no way of predicting when your bike frame will fail; I only know that, since it is aluminum, it will eventually fail from fatigue, if it is ridden enough miles. 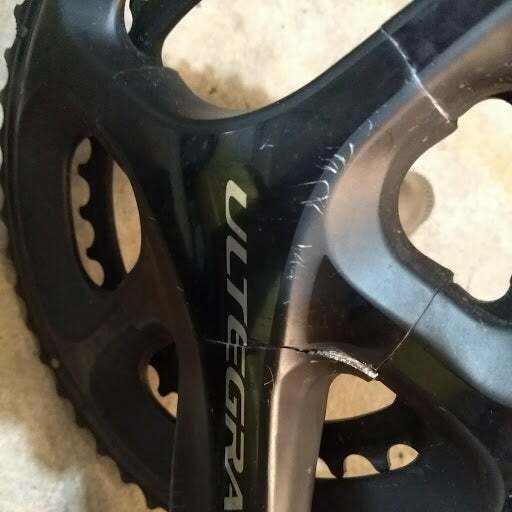 It seems to me that the downside of a frame failure on your lengthy loaded tour would be high — it would cause you considerable additional hardship. You do have a lot of miles on that frame, and, given that a lot of those are loaded miles (putting you higher on the S-N curve, resulting in a lower number of stress cycles to failure), it might be time to let go of that bike and get a new one for your tour. If you had a steel or titanium frame, I could make no such prediction of certain fatigue failure. That’s because, if the frame’s designer chooses steel or titanium tubes whose tensile strength and dimensions (wall thickness, diameter, and shape) are such that the stresses seen while riding will never exceed — say, 40 percent of its tensile strength in its heat-affected (i.e., weld) zones — then the frame will last indefinitely in the absence of a crash. Of course, notches or dents or poor welds (or, in the case of steel, rust) will lower that limit (as well as lower the tensile strength) and cause fatigue failure to occur at a lower stress or lower number of cycles. I suspect you asked the question because you had some trepidation about taking that bike on your tour. While it may survive the tour, I think the probability of it not surviving it is high enough that it would be worth the peace of mind of instead riding a bike that gave you more confidence in its longevity. I just had an Ultegra 6800 50×34 crankarm fail at the glue joint after 3 years, resulting in a tearing of the aluminum spider (see photo here). Not shown is the glued seam that has split apart. I use a 20mm pedal extender from Knee Savers. Is this a faulty crankset, or are hollow crankarms just not strong enough to handle the additional load brought about by having the foot further from the attachment point on the arm? I can’t find anything about this on the web. Shimano sells the PD-9100 pedal that allows 8mm of play side to side, so clearly they permit some movement of weight away from the pedal attachment point. 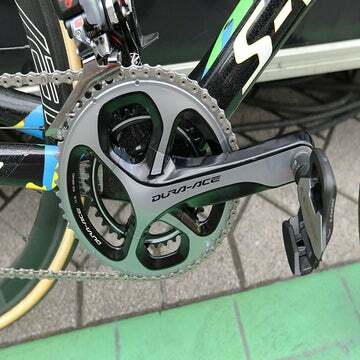 Do you think that the 8000 series crankset, with its much beefier arm at the spider end, is a better choice? If I need to use a crankset with solid arms, what do you recommend for a Di2 setup? I’m asking you this question because you sell bicycles for “oversized” people, and you must have run into this problem in some way. If not pedal extenders, then heavier people. I weigh 175 pounds and stand occasionally while pedaling. I’m not a masher — other than when standing, I pedal at 90 rpm and am fairly light on the pedals. You’re right; I certainly have run into this issue. 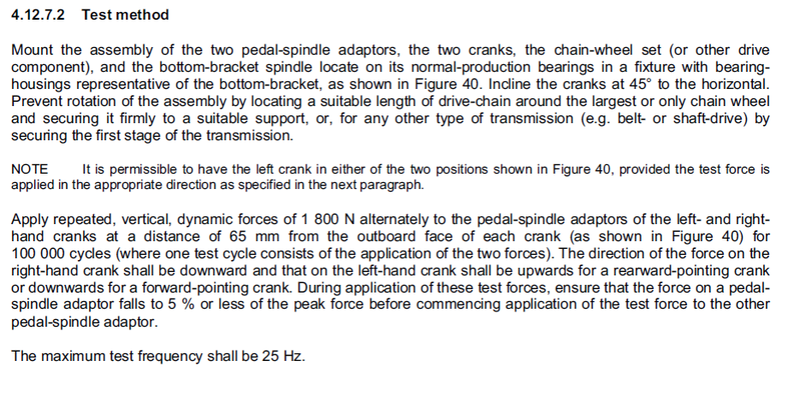 Yes, the extra leverage of standing on pedals with a 20mm longer spindle multiplies the stress at the pedal eye of the crank compared to the same pedaling force with standard-length spindles. And many times, bike fitters have prescribed extra-long pedal spindles for big customers of ours in order to get their knees closer to vertically aligned above their feet. Since these customers are also heavy and very strong, crank longevity is a definite concern. We often build the bikes for tall people with a high bottom bracket coupled with extra-long cranks so that their crank length is a more standard proportion of their leg length than, say, a 175mm or 180mm crank would be; thus, we are often not using Shimano cranks on an otherwise Shimano drivetrain. The extra-long cranks we make in Boulder we have tested in a lab to ensure that they endure far beyond the crank-fatigue standard required by the European Union. And when we sell extra-long cranks made by Asian manufacturers, we request test data, using the same ISO4210 fatigue-test protocol, from the crank manufacturer. 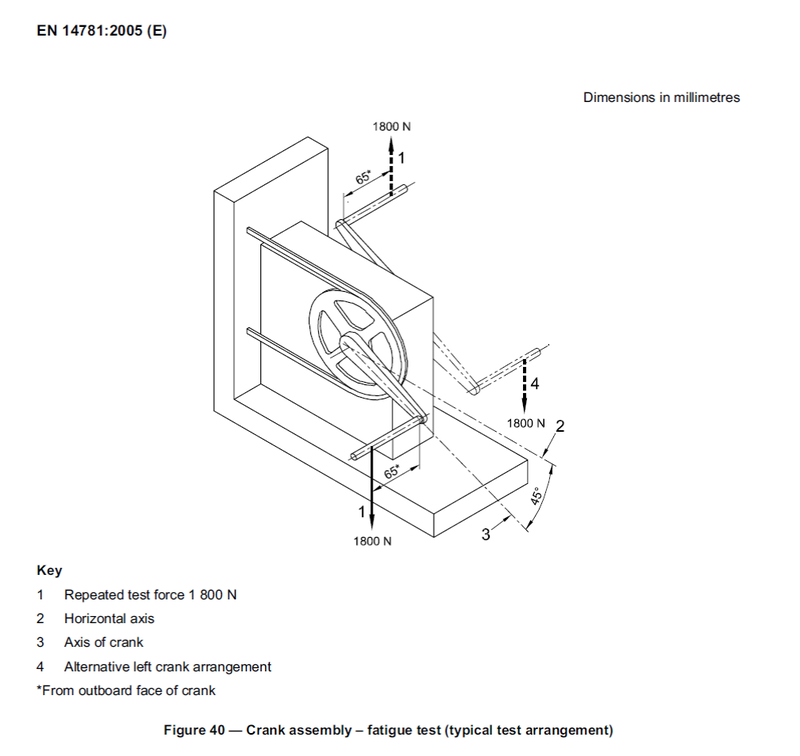 I have attached an illustration and description of the ISO4210 crank fatigue test (formerly called EN14781); a video of the test can be seen at the bottom of this page. I would expect you to be able to get a lot more than three years on any crankset, including that one, with your 175 pounds, regardless of the 20mm longer spindles. As described in my prior answer, aluminum is subject to fatigue. Of course, if the glue joint failed first, that is a completely different issue from straight aluminum fatigue, since the crank would no longer have the structural integrity granted by its clamshell construction. If that were the case, that would be cause for a warranty appeal, but this is out of the two-year warranty. In any case, the stresses you are applying on the S-N curve that I described above are higher due to those longer spindles, which results in fewer stress cycles to the point of failure. I can’t answer whether a Shimano 8000 series crankset will last any longer, since there are so many variables involved, and I’ve never seen fatigue-test data on either. Shot-peening, for instance, which increases fatigue life, could have been done on one crank and not the other, and/or the aluminum alloy could be different, and I have no idea about the wall thicknesses in each or how the extra crank width influences its durability. While solid arms in the same alloy and shape as your Ultegra cranks would almost certainly last longer than yours, solid arms in a different crank design do not necessarily guarantee more longevity than a well-made hollow one. As for whether non-Shimano cranks will work on your Di2 setup, I also have lots of experience with this, since we sell a lot of Di2 bikes, and they usually don’t have Shimano cranks on them (because the cranks are 190mm-215mm long). Assuming your Di2 setup is 11-speed, you of course ought to get an 11-speed crank. After that, the most important thing is to get the stiffest chainrings you can, and there are lots out there that work just fine with Di2. I wanted to chime in on Joseph’s question about fitting an 11-speed cassette on a 10-speed hub. I was in a similar situation. Almost all of my wheels have 10-speed freehubs, but I now have an 11-speed drivetrain. I purchased a Shimano 105 5800, 11-28 cassette and removed the third cog (the 13T) because the 11T and 12T nest together. Besides adjusting the derailleur limits, as you mentioned, you also need a slightly thicker spacer behind the cassette to make this work. Without the spacer, the cassette can’t be tightened enough. Other than that, the setup has worked well for me! I’ve done that by removing the 11t cog and keeping the 12t. You’ll need a lockring for 12t cassettes. The new Shimano R7000 11/34 cassette comes with a spacer and fits on a 10-speed wheel just fine. No need for Dremel or redishing. Joseph asked about using a reduced 11-speed cassette on a 10-speed freehub. I did that about three years ago when I was trying to build a gravel bike on a budget. I found a deal on a pair of 29er wheels that fit the bill except for 11-speed compatibility. The cassette I wanted to use was an 11-speed 11-32 Shimano 105. The three largest cogs were on a carrier, but all the remaining cogs were individual. I had to buy a 13-tooth, second position cog and a 12-tooth outer cog to replace the 11, 12, and 13 cogs of the original cassette, and it all fit together perfectly. I set the limit screws so that I can’t use the last click in the shifter, and it’s still working great three years later. I rarely ever use the 50×12 on that bike, so I’m not really missing the 50×11 anyway. 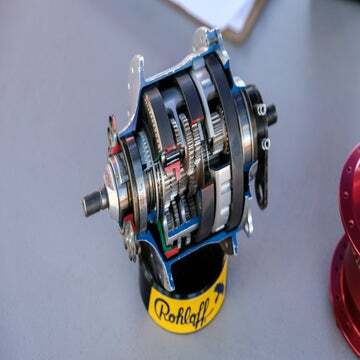 I was reading with interest your response about fitting an 11-speed road-bike cassette on a 10-speed freehub with Shimano 11-speed road-bike shifters. Your response brought me to a YouTube video where it mentions that approach (and which spacer to omit) as well as six other alternatives. 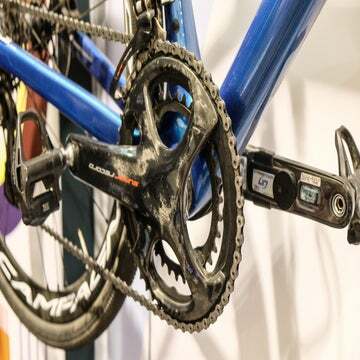 But more importantly, one of the viewer comments mentions an even better way; simply use a Shimano 11-speed MTB cassette on the 10-speed freehub. Apparently, that works because the largest cog is concave on the side where it butts up against the freehub (just like 11-speed campy cassettes are). I think this is the most straightforward method next to installing an 11-speed freehub (if it truly works). I noticed that you said that 2009 Veloce was Powershift — it wasn’t. It came out as Ultrashift and changed shortly thereafter. The user can potentially still fix his shift levers.